Legendary vaudeville comedian, radio personality, and actor who entertained military personnel in 57 USO tours between 1942 and 1988. He pioneered a form of self-deprecating humor, performed hundreds of acts per year during the height of his career, hosted The Academy Awards fourteen times, and appeared in over 70 films and shorts. 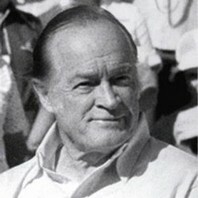 How much is Bob Hope worth? You can calculate Zsa Zsa Gabor's age by the rings on her fingers.